From the racetrack to the history books, the TAG Heuer Monaco watch is an instantly recognizable classic. The Principality of Monaco is the most densely populated sovereign state in the world. During the Monaco Grand Prix, thought to be of the most important automobile races in the world, thousands flock to the city-state and the population nearly triples. The TAG Heuer Monaco watch embodies the core of the prestigious race and the sport of auto racing, but the journey was decades in the making. Since it was founded in 1860, TAG Heuer has established a reputation as the world’s leading manufacturer of reliable and robust chronographs. The Swiss label has contributed its fair share of innovation to the world of watchmaking. As the label grew in popularity, the brand became directly tied to the development of the sport of automobile racing. The first major milestone came in 1916 when the Heuer introduced the patented Mikrograph. This game-changing model was the world’s first stopwatch with a precision of 1/100 of a second. TAG Heuer followed this up the Autavia in 1933, the first dashboard watches for automobiles and aviation. In the same year, the TAG Heuer pocket chronographs were used as official stopwatches for the Olympic Games. This cemented the brand’s reputation as a leading name for precision timekeeping in sports in the early days of racing. By the 60s, a young Jack Heuer, great grandson of the founder, held the reins at Heuer. He saw the booming world of motorsport and all its glamor and excitement as lucrative business for the brand. His first major mark on the brand was the relaunch of the Autavia. He followed this up with the release of the Carrera, a watch specifically designed for racecar drivers. Heuer named the timepiece after the Pan American road race and it quickly became a staple among racecar drivers for its simple yet effective chronograph design. The connection between TAG Heuer and the sporting world was further consolidated in 1969 with the creation of the Monaco. Automatic winding watches were a hot fixture on the market at the time. As the brand was pumping out Carreras, they also worked separately on the world’s first automatic chronograph movement, housed in the classic Autavia. Heuer, however, wanted to achieve a less traditional timepiece built around the innovative new movement. The Monaco was the result of a partnership between Jack Heuer, Dubois Depraz, the leading specialist in the development of the modules, and Breitling, who shared the funding of the expensive undertaking. The dubbed “Project 99” resulted in a modular automatic chronograph built on a Buren base movement with an independent Dubois-Depraz chronograph attached to the watch. Erwin Piquerez, owner of a Swiss company that produces watch cases, proposed a square case that was also waterproof. It was positioned within the world of automobile racing and was made available to the public at Basel Fair of that same year at a retail price of $200. Named after the prestigious Monaco Formula One race, it was the world’s first waterproof automatic chronograph in a square case. The timepiece was further polished off with its metallic blue dial, domed plastic crystal and crown positioned on the left to remark that the watch didn’t need winding. The counters at the 9 o’clock and 3 o’clock were meant to precisely measure chronograph hours and minutes. The Monaco was an industry disrupting product with its unique square case design. The legend of the TAG Heuer Monaco is consolidated with its hero, Steve McQueen. In 1971, the iconic Hollywood actor was filming Le Mans, a film that depicted the famous 24 Hours of Le Mans auto race. McQueen’s was set to depict the film’s main character who was racing for the Porsche team. Inspired from Swiss driver Jo Siffert, who was a consultant on the movie. He was the leading man for the Porsche team competing in the World Sportscar Championship. He also happened to be a good friend of Jack Heuer’s and an ambassador of the brand on the track. McQueen wore the same jumpsuit of the Swiss champion, boldly sporting the TAG Heuer logo on his chest. In a bid to depict Siffert as accurately as possible, he also matched the chronograph on his wrist. While Siffert preferred to wear the round Heuer Autavia 1163T, McQueen instead opted for the square-shaped Monaco chronograph. The timepiece drew him in with its unconventional look. The blue dial and unique design was highly visible during the film and had become forever associated with the legendary Hollywood star himself and all of the glamor and excitement of the Monaco Grand Prix itself. The timepiece garnered tons of exposure during the movie and it wasn’t long before the Monaco 1133B became one of the most recognizable sports watches ever designed. The Monaco was considered a limited success at first, largely due to its unusual shape. By 1975 it had disappeared from catalogues and Heuer halted its production. It wasn’t until 1998 that the brand recognized the heritage of the ingrained watch and launched the successful “Re-Edition” series that was inspired by classic chronographs from the 1960s. Louis Vuitton Moët Hennessy (LVMH) took over TAG Heuer the following year. Since then the watch has remained a fixture in luxury fashion and high fashion. In 2003, LVMH released the Modern Monaco, reference CW2113. It is defined by the Tag Heuer logo rather than the traditional Heuer logo. By its aesthetics alone, the Monaco was a brilliant feat in watchmaking. It remains one of the flagship models to TAG Heuer to this day. And is one of the most distinguishable watches ever made. The square casing was truly revolutionary. 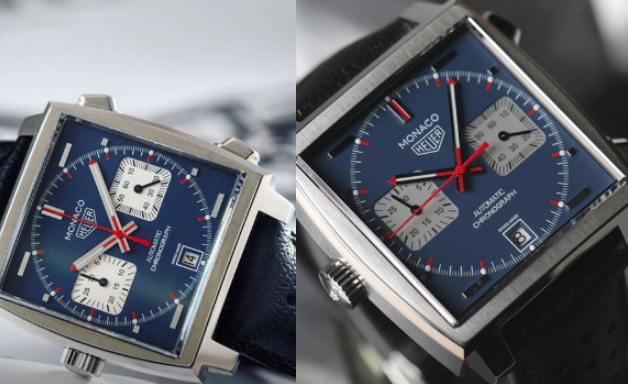 The TAG Heuer Monaco remains one of the coolest watches on the market four decades after its initial launch. It’s an instantly recognizable classic that isn’t going out of style anytime soon. The rich heritage of the timepiece packs a big punch. It’s also directly tied to the development of the Monaco Grand Prix and embodies the thrill and excitement of the sport of automobile racing itself.